The Cabinet unanimously supported the candidacy. The Cabinet of Ministers at a meeting on Wednesday, 8 February appointed Serhiy Knyazev the head of the National Police of Ukraine. The decision was taken unanimously, Prime Minister Volodymyr Groisman said after the meeting. 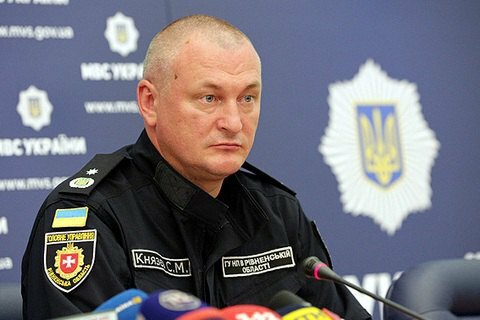 The previous head of the National Police Khatia Dekanoidze stepped down on November 14, 2016, after which Interior Minister Arsen Avakov has appointed his first deputy Vadym Troyan as temporary replacement. Later, Avakov has announced a competition for a new head National Police. 64 people took part in the job contest, including Troyan, his assistant Kostyantyn Bushuyev, chief of the Criminal Investigation department Serhiy Knyazev, Head of the Main Police Department in Kyiv Andriy Kryschenko, head of the Odessa Police Department Dmytro Holovin, Donetsk Region police chief - Vyacheslav Abroskyn, Chernihiv's Eduard Alekhin, and Chernivtsi's Serhiy Pilihrim . In January, Troyan and Kryschenko pulled out of the contest. Based on the results of rating voting, the contest's advisory commission recommended Kostyantyn Bushuyev, the Director of Legal Aid Center Andriy Vishnevsky, and Serhiy Knyazev for the job. Last week Avakov said he would submit Knyazev's candidature for government's approval. Serhiy Knyazev, 45, is a third-rank police general. He started his career in 1992 in Bila Tserkva. In 1995 he joined the criminal police force in Bila Tserkva city police department. In 2008, Knyazev was put at the head of police department in Kyiv Region. In November 2014, he was appointed acting deputy chief of the Interior Ministry in Donetsk Region as the chief of the criminal police. In July 2015, he was appointed the head of police in the Transcarpathian Region, right after the armed conflict in Mukachevo. Last April, Knyazev was transferred to the post of head of the police in Rivne Region to sort out the problem with the illegal extraction of amber in the region. Six months later, he was appointed head of the Department of Criminal Investigation of the National Police of Ukraine.